Clay composition poker chip; harp rim mold; fine used condition. $5.00 POST-PAID. For ordering instructions, see the link above. 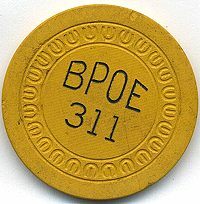 For other B.P.O.E. Elks Club poker chips sold by us, click here .